When Apple introduced the App Store in 2008, much of the excitement spanned from the opportunities and functionalities these new apps would bring to the iPhone. Many of the first apps were forays into markets untouched by the stock apps – games, social networks, and read-it-later services. Eight years later, the trends are different; with millions of apps covering almost every genre imaginable, a lot of this year's best apps are refinements or new takes on the same functionalities some of Apple's stock apps offer. That's where Partly Sunny comes in – it's a weather app that, at first glance of its icon, looks almost identical to Apple's Weather. But after tapping into it, Partly Sunny shakes the similarities and introduces a robust, beautiful new way to view weather information. Partly Sunny, like other paid weather apps, is loaded with data. At its most informative, the app will give you temperature (high, low, “feels like,” and current), precipitation chances, sunrise and sunset, cloud cover, humidity, visibility, and multiple charts and graphs. That sounds cluttered, but Partly Sunny’s interface is designed to only provide you as much information as you want for it to show. In the Locations screen that acts as a hub for all your saved cities, you’ll see your current location and a “glance” with current temperature, weather conditions, the day’s highs and lows, and the likelihood for precipitation. 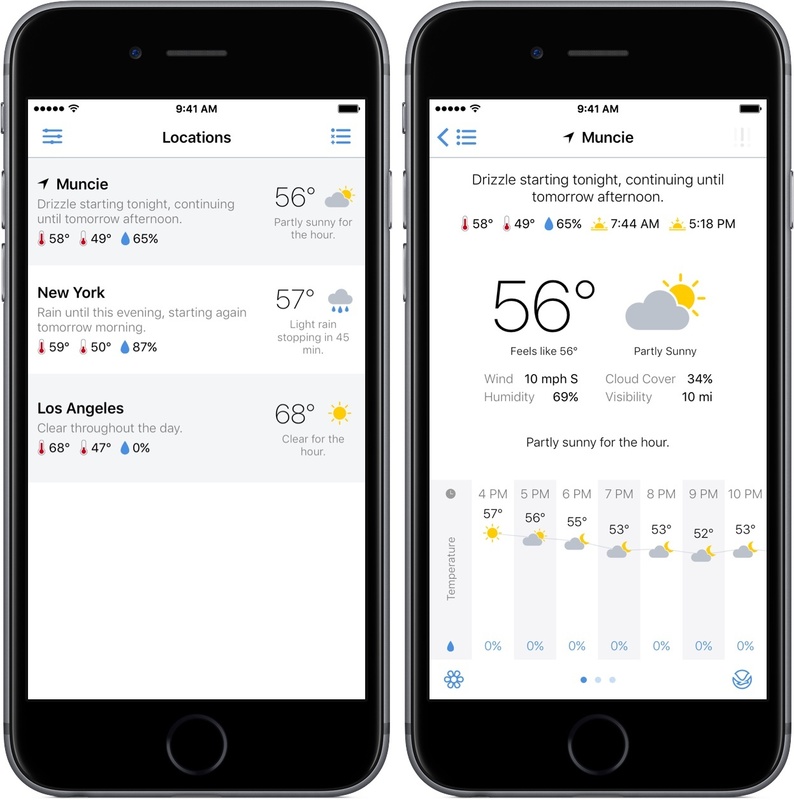 In reality, this information is good enough for a lot of people – but for $2.99, it’s not much more than what a free weather app would offer, including Apple’s own. That’s where the detailed look comes in, and having all of the information I mentioned earlier is where you’ll find the most value out of the $2.99 you pay. By presenting information in one location without the need for much scrolling, Partly Sunny makes viewing multiple sets of data as easy as two taps. The issue Partly Sunny faces, though, is that we’ve seen weather apps throw useful information at us for years. To combat falling in line with all of its competitors, the app offers two graphs – one for hourly forecasts and one for weekly forecasts – that are just different enough from apps like Dark Sky to catch your attention. In the first, Partly Sunny provides an hour-by-hour graph of what the day will look like in your location. By default, the chart will automatically include the temperature, a glyph of the weather conditions, and the precipitation chances; however, tap the label on the left side to change to cloud cover, dew point, humidity, or other metrics. The second, which is found by scrolling further down the page, gives a weekly overview of the forecast. If you want to see more specific details about a day ahead, you can tap into that and see all the robust information Partly Sunny can offer. When comparing Dark Sky (my previous choice for weather app) and Partly Sunny, I couldn’t help but think that the latter’s presentation of data was vastly superior. With Partly Sunny, I was able to access useful information more quickly, whereas Dark Sky required me to scroll, swipe, and dig into selections more. I’ll include a side-by-side comparison below for your judgement. 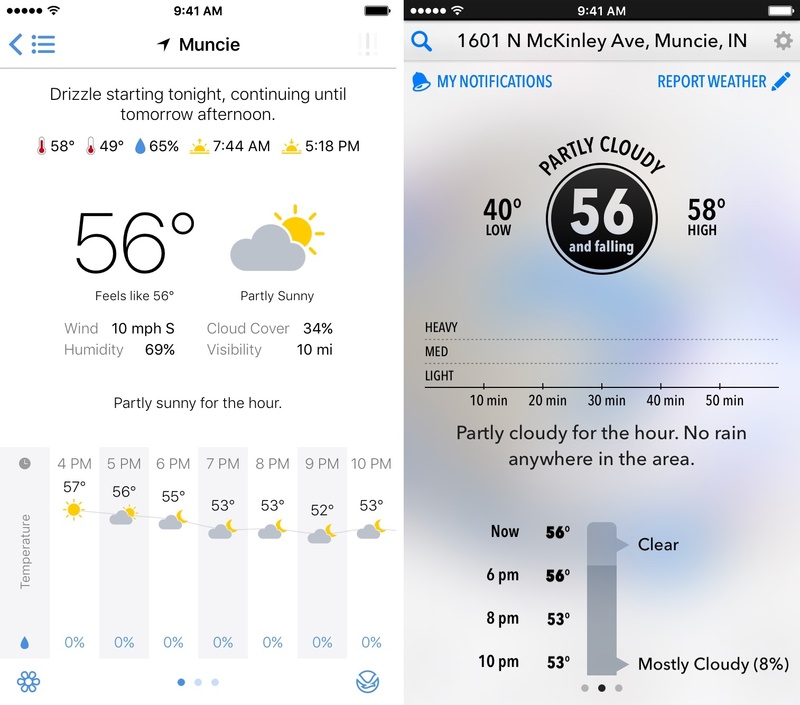 What’s immediately striking about Partly Sunny’s design is that it feels designed to belong in iOS – it features glyphs, thin text, and white backgrounds. It’s an app that feels built by Apple if the company decided to make a massive iterative change to its own stock Weather app. The app’s design isn’t overwhelmingly heavy on symbols or text, but uses both in meaningful ways that don’t feel unnecessary. For example, rather than displaying “Partly Sunny” (my actual weather conditions at the time of writing) in large letters next to the current temperature, the app shelved the text below a picture of a sun shining from behind a cloud. Partly Sunny’s ability to use both in conjunction provides the perfect sense of organization, the information being both digestible and informative without much effort. By tucking a large graph under a scroll gesture, the app only gives you the bigger data when you need it. With the inclusion of a dark mode activated by a switch in the settings or a two-finger swipe gesture up or down and an iPad version (which is, unfortunately, always stuck in portrait), Partly Sunny is the complete package in design. 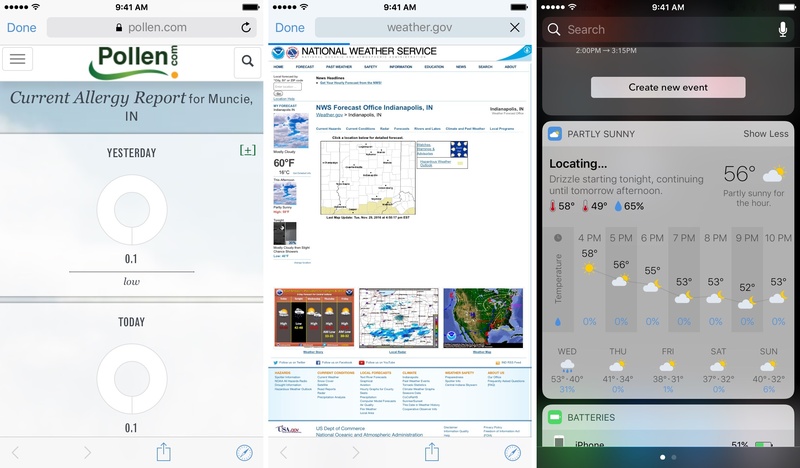 Although I’m usually stuck in the middle of Indiana, frequent travelers will appreciate Partly Sunny’s support of multiple locations, which are displayed as glances and detailed view. To quickly switch between cities, simply swipe your finger left or right when looking at the detailed view. Also included in the detailed view are links to pollen.com and the National Weather Service, each configured for the specific city you’re in. Those can be found at the bottom left and right and both use Safari View Controller to open the links in-app. Lastly, Partly Sunny also features a great widget that, at minimum, will show you the same information displayed in the Locations screen in the app itself. When you tap “Show More” in the widgets screen, you’ll get access to two condensed versions of the graphs mentioned above. Before purchasing many apps, I often ask myself the same question: how much am I willing to pay for a slight improvement on what this app will replace? With Partly Sunny, the cost of ditching your old weather app for this one is $2.99 and, at least for me, the price is worth it. 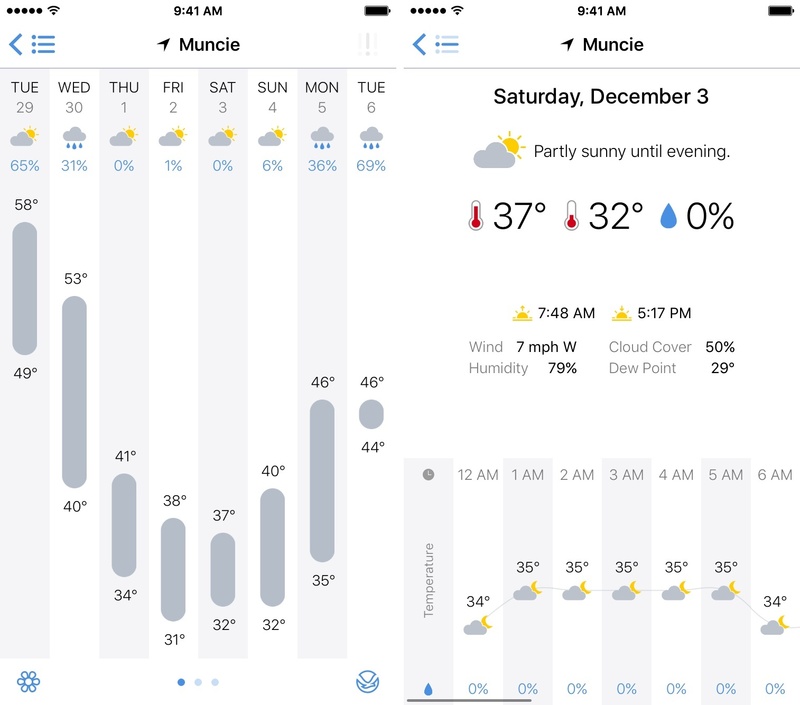 Although Partly Sunny lacks radar and an Apple Watch app, its improvements on Dark Sky’s design and hierarchy of information is well worth its price of purchase. And for those using a free weather solution, I encourage you to give the app a try for its relevant weather data. Arguably my favorite part of Partly Sunny is that it’s only in version 1.0, meaning that it should have a long life ahead with updates to come. If its first version is any indication of its future, Partly Sunny has a lot of promise. You can pick up Partly Sunny in the App Store for $2.99 (iPhone and iPad).